For the destrict in Madrid, see Tetuán (Madrid). For the ceety in Tunisie, see Tataouine. 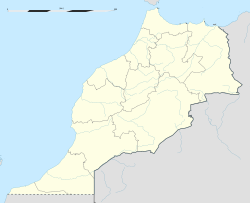 Tétouan (frae the Berber ⵜⵉⵜⴰⵡⵉⵏ, Arabic: تطوان, Spaingie: Tetuán, French: Tétouan) is a ceety in northren Morocco. The Berber name means leeterally "the eyes" an figuratively "the watter springs". Tetouan is ane o the twa major ports o Morocco on the Mediterranean Sea. It lees a few miles sooth o the Strait o Gibraltar, an aboot 40 mi (60 km) E.S.E. o Tangier. In 2004 the ceety haed 320,539 inhabitants (census figur). Tetouan's ceevil airport Sania Ramel Airport is locatit 6 km tae the east. Wikimedia Commons haes media relatit tae Tetouan.